It’s My Birthday, Now What? Today I turned 25 and am now officially a 20-something. Yikes. Pretty soon I’ll be approaching the 30-something genre of life. Which I’m pretty sure means, complaining about work, looking at which stroller to buy and determining the weather cycles through joint pain. So many wonderful things to look forward to. 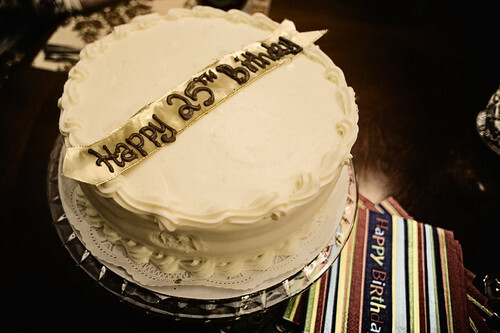 Meanwhile, here in Houston, we celebrated my birthday for 48 hours, though I am going to push for another 24 for an even 72, thoughts? Last night was the pre-birthday party. The cake was created by our favorite cake shop here in Texas, Take the Cake, you really should check them out. Annabel Trudeau makes the most amazing cakes. Today, my actual birthday I got to hang out with mom and dad, went through some of my old keepsakes which was hilarious and fun… Gotta post some of those pictures. Then sushi for dinner, my favorite. Once again, my birthday passes without Ryan! It’s crazy to think that I have not been with Ryan for my birthday, ever. I’ve been in California or he’s in Tennessee or I’m in Texas… next birthday, it sure better happen! So I’m 25, now what? I can rent a car. This entry was posted in Life, Thoughts and tagged Birthday, Family, Houston, Party, Texas by Justin Scott. Bookmark the permalink. .-= Carrie´s last blog ..my nephew =-. Hey. don’t knock the ability to rent a car. I’d imagine it would be quite handy when traveling to places that (gasp!) don’t have mass transit or don’t come with a car furnished by the reason you’re going there (like a business trip or something). Happy birthday… again (and after the fact).